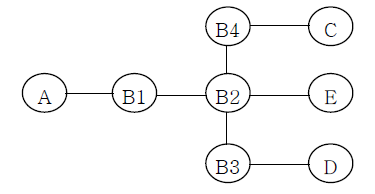 In above picture, D is sending packet to E and bridges B1,B2,B3,B4 have no forwarding entries. Firstly, D sends packet to B3 nad B3's forwarding table is updated. B3 sends packet to B2. Therefore, B2's forwarding table is updated but B2 doesn't know MAC address of E.
B floods ARP request to all the ports and E replies as ARP reply packet. In this situation, does B store E's MAC address in its forwarding table? and Is it right mechanism? A bridge solely works on the data link layer (L2). It has no notion of IP addresses or IP-MAC associations (usually stored in an ARP table) required for the network layer (L3). That's not the way it works. For an IP packet, D first needs to find out E's MAC address - it sends an ARP request (broadcast) which is forwarded by all bridges. The bridges also learn D's MAC address and the port it's located on from their perspective. E replies to the D's ARP request (by unicast), updating B1 and B2 with its MAC address/port combination. When D sends the actual IP packet, the bridges on the path have already learned all they need to know. Generally, an ARP table and a MAC address table (also source address table or CAM table) are two very different things. An ARP table maps (local) IP addresses to MAC addresses. A MAC address table maps MAC addresses to (local) ports. A node participating in IP requires an ARP table but usually doesn't have a MAC table. A bridge/switch doesn't actively participate in IP but for its L2 function it requires a MAC/port table. Not the answer you're looking for? Browse other questions tagged arp bridge or ask your own question. Why does my router not reply to ARP requests? Are ARP replies sent directly to the solicitor? What are the reasons for seeing an incomplete ARP?